Middlesex is the story of Calliope Stephanides, and the three generations of Stephanides before her. The book follows the family from generation to generation from a tiny village in Greece to Detroit, Michigan. While searching for answers as to why she is different from other girls, Calliope uncovers a dark family secret and a genetic condition that has been hidden for many years. Understanding that secret is what finally allows Callie to become Cal and to finally feel whole. 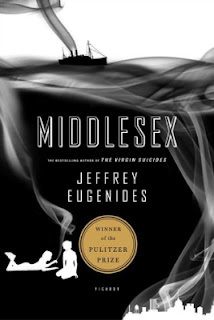 Middlesex is an epic tale of a family's immigration to the United States and what it means to become an American. It is an interesting look at how the history of our family can shape us into what we will become. Calliope's story is at times heartbreaking, but written so truthfully it is beautiful. This book is a little bit of a heavy read, and not for everyone due to some sensitive sexual material, but it is so beautifully written it's hard to put down. Jeffrey Eugenides is a master of words.